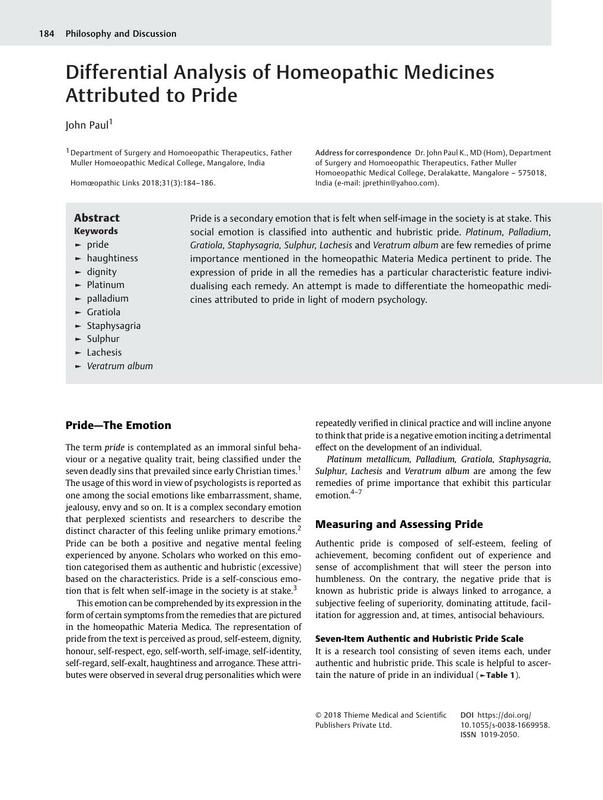 Pride is a secondary emotion that is felt when self-image in the society is at stake. This social emotion is classified into authentic and hubristic pride. Platinum, Palladium, Gratiola, Staphysagria, Sulphur, Lachesis and Veratrum album are few remedies of prime importance mentioned in the homeopathic Materia Medica pertinent to pride. The expression of pride in all the remedies has a particular characteristic feature individualising each remedy. An attempt is made to differentiate the homeopathic medicines attributed to pride in light of modern psychology.